Idaho Territory, June 1887. A small-town judge takes his young daughter fishing, and she catches a man. Another body surfaces, then another. The final toll: over 30 Chinese gold miners brutally murdered. Their San Francisco employer hires Idaho lawman Joe Vincent to solve the case. Soon he journeys up the wild Snake River with Lee Loi, an ambitious young company investigator, and Grace Sundown, a métis mountain guide with too many secrets. As they track the killers across the Pacific Northwest, through haunted canyons and city streets, each must put aside lies and old grievances to survive a quest that will change them forever. 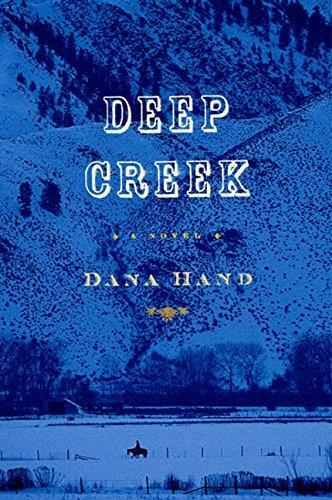 Deep Creek is a historical thriller inspired by actual events and people: the 1887 massacre of Chinese miners in remote and beautiful Hells Canyon, the middle-aged judge who went after their slayers, and the sham race-murder trial that followed. This American tragedy was long suppressed and the victims nearly forgotten; Deep Creek teams history and imagination to illuminate how and why, in a seamless, fast-moving tale of courage and redemption, loss and love. A dazzling new novel for fans of Leif Enger, Lisa See, and Ivan Doig. Dana Hand is the pen name of Will Howarth and Anne Matthews, who live and work in Princeton, NJ. Under their own names, they have published eighteen nonfiction books on American history, literature, and public issues. Deep Creek is their first novel. “Deep Creek is a vivid, scary, beautiful exploration of a dark moment in American history, all but forgotten, now brought explosively to life.” —Richard Preston, author of The Hot Zone and The Wild Trees. —Donald Worster, author of Under Western Skies and Dust Bowl. “Dana Hand has created a remarkable book—both a high-voltage crime novel and a true account of a violent episode in the history of the American frontier. And it works—vividly, with a fierce narrative power that never slows down.”—Samuel Hynes, author of Flights of Passage. The story emerges from four actions: Lee asks Joe to lead an investigation; Henry asks Grace to come and help; after a ten-year absence, Grace agrees; and Joe consents to let Grace serve as river guide. What motives, evident and secret, impel these events? Joe is a lawyer and investigator, able to examine bits of evidence and find cause-effect patterns. But certain liars can fool him entirely. Why? Grace is quick, intuitive, learned, and bitter. What are the sources of her frustrations? At first, Lee Loi is cheerful, self-centered, and cocky. What are the sources of his confidence? Why are his views so conventional? A refrain in Joe’s life is How much of that is true? The recurring answer: As much as you want it to be. Why are the crimes at Deep Creek so important to him? On the return journey to Deep Creek, we learn that Grace has second sight and strange abilities. How does this side of her affect relations with others, especially Joe? When and why does Lee begin to change? What role does he play after the river trips? When do the three investigators truly become a team? How do the Chinese miners behave, as individuals and as a group? Are they strange, alien, or clannish, as their detractors claimed? What aspects of their lives are most surprising? Duty and honor take many forms. Is Joe a patriot? Is Jackson? Is Grace a good daughter? Is Nell? Why will Dow and Yap never break their promise to Elder Boss? Why is Libby Leland so calculating and controlling? Why is she so successful? Why is Blue Evans such a natural leader of men? What were his motives at Deep Creek? How would Vollmer tell this story? How would Libby? Why are so many of the characters wanderers, or exiles? What makes a family? After the trial, each character experiences a process of compensation. Explain.